The Inverness Palace Girly Intoxicating Tea Party is not just any old afternoon tea party, this is a fantastic girly tea party with a twist! So sit back, relax in the brand new stylish Lounge, Bar & Brasserie and let the Palace Hotel make it happen for you! You’ll find your Intoxicating tea party dressed with lovely classic cake stands offering all sorts of delicious and delicate nibbles. 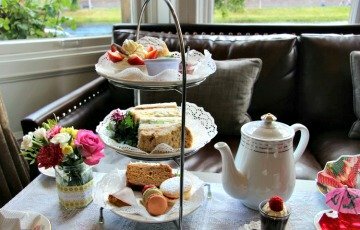 Your eyes will pop when they see dainty finger sandwiches, fresh scones with lashings of cream and jam and a fabulous selection of cakes and sweet bites to guarantee a super sugar hit! But it doesn’t stop there…your vintage tea pots will offer some extra delights filled with the very best of the Palace Cocktails & Mocktails for you to sip and enjoy in your classic china cups! Followed by very classy mini Vodka jellies. You can also book your own Tea Party room and bring your own play list too! Why don’t you really make an afternoon of it and get glam’d up with the girls – there really is no better excuse for a bit of sparkle and bling than your intoxicating tea party! Girls’ Party room for your party games only £25 per hour or £69 from 7-11pm. Balloons £8.50 for 3 or £12 for 6 balloons. Girly Table Decorations £3.95pp (minimum of £10.00 per party). Goodie Bag for Hen/Birthday Girl £15 per bag. Note: All prices are 2018 prices please download the flyer for full details. Prices are per person per night based on 2 sharing a twin room. The book direct wine offer does not apply to any Girls Packages as drinks packages are already included.